Orders must be placed by February 16th! 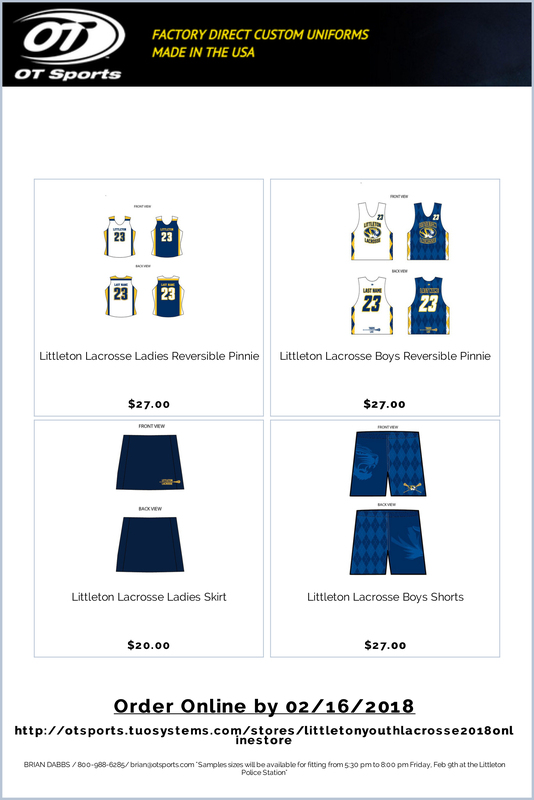 The on-line store for ordering uniforms is now open! Please click on the flyer below and you should be directed to the online store. If you have any problems please contact OTSports, Brian Dabbs, 800-988-6285 or brian@otsports.com. You must place your order before 10:00 pm on Friday, February 16th. The online store must close immediately at 10:00 pm on the 16th to ensure uniforms are delivered in time for our first games. Orders are produced in bulk and the entire order must be finalized before production can start any delays will impact the entire program order. Once the on-line store closes there will be no other opportunity to order new uniforms so please be sure to complete your orders as early as possible. Sample sizes will be available for fittings on Friday Feb. 9th at the Littleton Police Department from 5:30 pm to 8:00 pm only. Please note, there are no changing rooms so please come prepared to try on garments in open setting. There is no requirement to purchase a new uniform if your son or daughter has one that still fits them from last year. Refer to the attached flier for instructions and website address, or click here. Sizing guidance is provided on the website but please do what you can to attend the fitting day or review sizing of existing uniforms with a friend. Please fill out the order form indicating how you would like your child’s name to appear on the back. It will be printed exactly as entered (all capitals). If you leave name box blank the jersey will be printed without a name. Thank you for placing your orders early and accurately. If you have any questions please reply to this email and we will do our best to assist.